Yesterday, there was rain off and on, and clouds the entire day. It was cooler than the past few days, and the nighttime was downright cold. 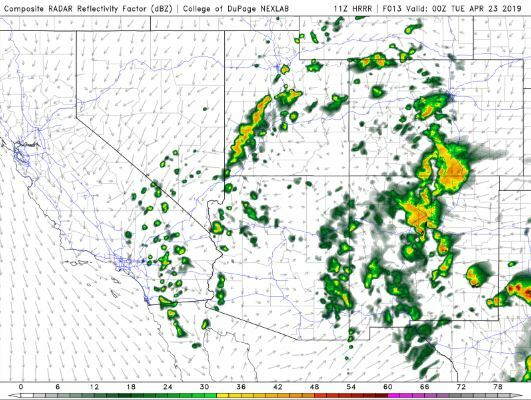 The NWS in Albuquerque, NM, forecasts (for Rio Rancho, NM) a mostly cloudy day, with a 40% chance of scattered showers and thunderstorms and a high temperature of 59 F. The winds will be from the east at 10-15 mph. This evening will be mostly cloudy, with a 20% chance of isolated showers and thunderstorms and a low temperature of 42 F. The winds will be from the east at 5-10 mph, becoming north after midnight. 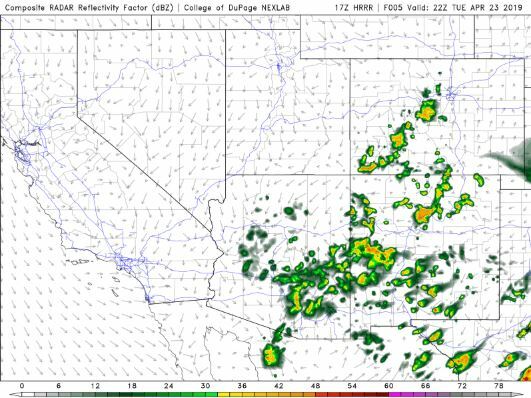 The NWS in Albuquerque, NM, forecasts (for Socorro, NM) a mostly cloudy day, with a 50% chance of showers and thunderstorms and a high temperature of 64 F. The winds will be from the east at 10-15 mph. This evening will be mostly cloudy, with a 30% chance of scattered showers and thunderstorms and a low temperature of 44 F. The winds will be from the east at 5-10 mph, becoming north after midnight. 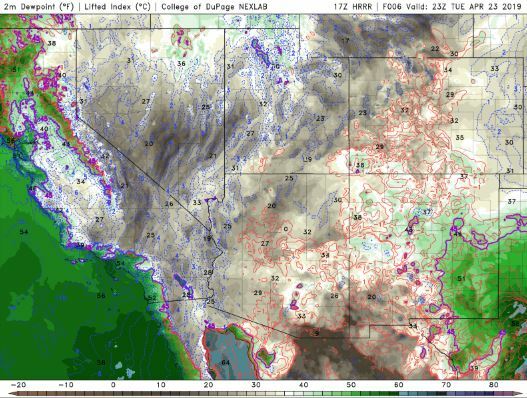 The NWS in Albuquerque, NM, forecasts (for Magdalena, NM) a mostly cloudy day, with a 60% chance showers and thunderstorms and a high temperature of 56 F. The winds will be from the east at 10-15 mph. This evening will be mostly cloudy, with a 30% chance of scattered showers and thunderstorms and a low temperature of 39 F. The winds will be from the east at 5-10 mph, becoming north after midnight. The visible satellite imagery shows that most of the state is under cloud cover this morning. The 12Z upper air sounding from Albuquerque, NM, shows a nearly-saturated atmosphere all the way up to 250 mb. There was 0.58 inches of precipitable water in the column. 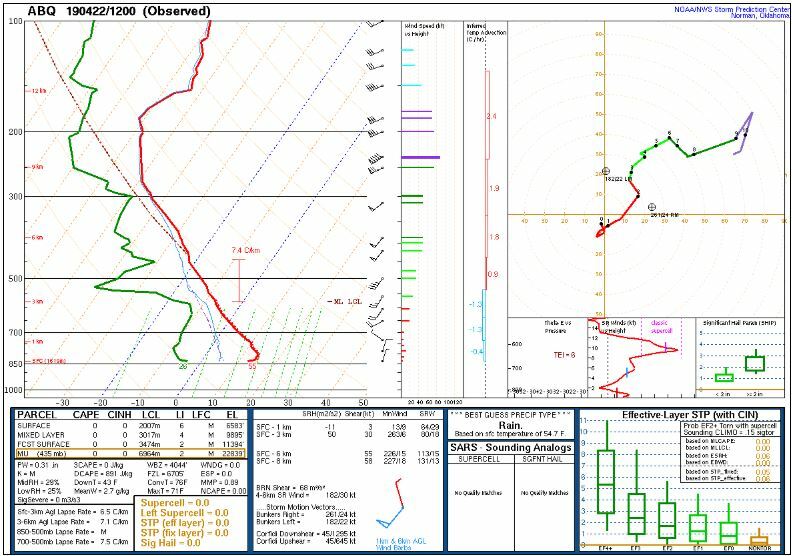 There was no Convective Available Potential Energy (CAPE) and no Convective Inhibition (CIN), and the Lifted Condensation Level (LCL) was 627 m. There was no thermal inversion near the surface and the 0-3 km lapse rate was 6.4 C/km. The hodograph shows that the low-level shear was 2 kts (due mostly to directional changes) and the deep-layer shear was 11 kts (due mostly to directional changes). 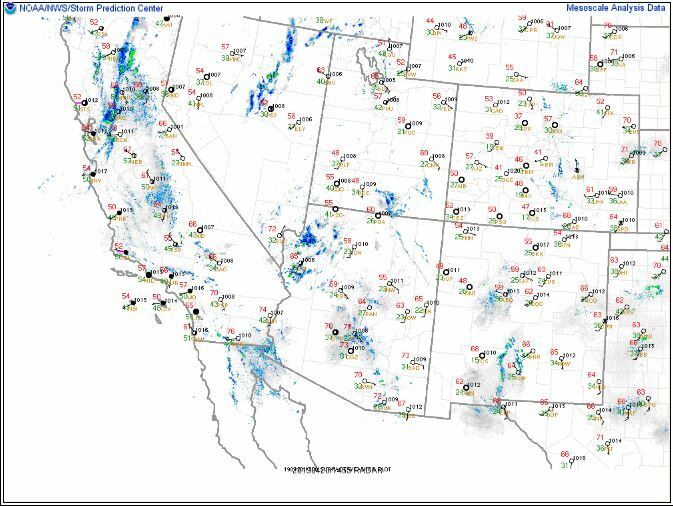 The surface observations chart (from the SPC Mesoscale Analysis Map) shows mild temperatures and high surface humidity this morning. The skies are cloudy (according to the sensors) and the winds are light and variable. 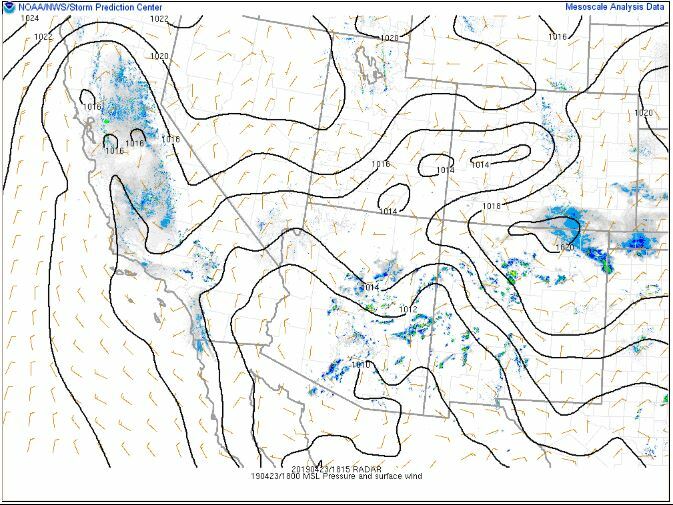 The surface pressure chart (from the SPC Mesoscale Analysis Map) shows that we are under no strong pressure systems or gradients so far today. The RAP shows this trend will continue for the next six hours. The NAM 250 mb chart shows light, southwesterly flow all day. 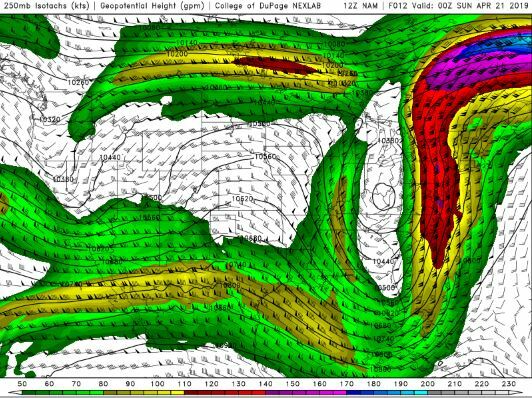 The NAM 850 mb chart shows that there is no strong thermal advection expected today. This chart has been excluded from today’s post. The HRRR simulated reflectivity shows that showers and thunderstorms are possible this afternoon. The HRRR predicts that the high temperatures for the middle Rio Grande River Valley will peak in the upper 50s F today. The HRRR shows that the dewpoints will remain in the 40s F.
The HRRR predicts that the skies are expected to remain cloudy most of the day. They will begin to clear up late this evening. Today will be a little cooler, cloudier, and perhaps rainier than yesterday. Yesterday was a pleasant day. I went for a run, and also did some gardening. It was a perfect day for being outside. This morning has been mostly sunny, cold and still. 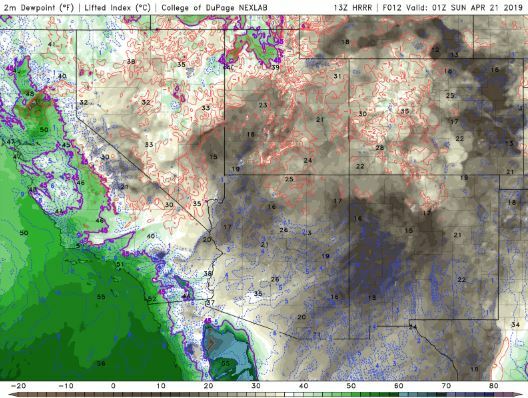 The NWS in Albuquerque, NM, forecasts (for Rio Rancho, NM) increasing clouds, with a 30% chance of scattered showers and thunderstorms and a high temperature of 70 F. The winds will be from the east at 10-15 mph. This evening will be mostly cloudy, with a 40% chance of scattered showers and thunderstorms and a low temperature of 45 F. The winds will be from the east at 15-20 mph. 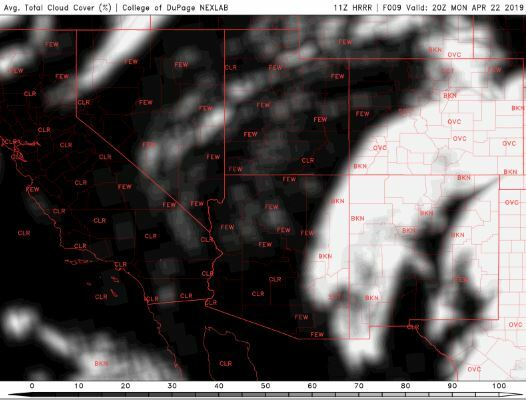 The NWS in Albuquerque, NM, forecasts (for Socorro, NM) increasing clouds, with a high temperature of 75 F. The winds will be from the north at 5-15 mph, becoming south in the afternoon. This evening will be mostly cloudy, with a 30% chance of scattered showers and thunderstorms and a low temperature of 46 F. The winds will be from the southwest at 10-15 mph, becoming north at 5-10 mph by midnight. 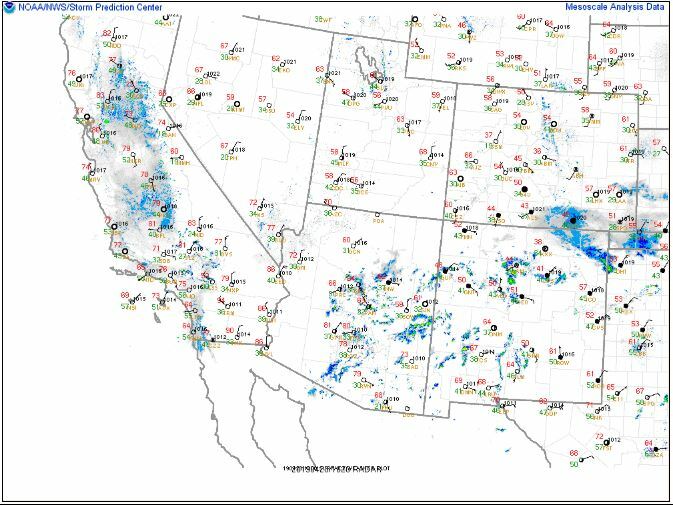 The NWS in Albuquerque, NM, forecasts (for Magdalena, NM) increasing clouds, with a 20% chance of isolated showers and thunderstorms and a high temperature of 65 F. The winds will be from the northwest at 5-15 mph, becoming southeast this afternoon. This evening will be mostly cloudy, with a 30% chance of scattered showers and thunderstorms and a low temperature of 40 F. The winds will be from the south at 5-15 mph, becoming north after midnight. The visible satellite imagery shows that most of the state is under cloud cover this morning. We have only a few clouds here in the Albuquerque Metro area. 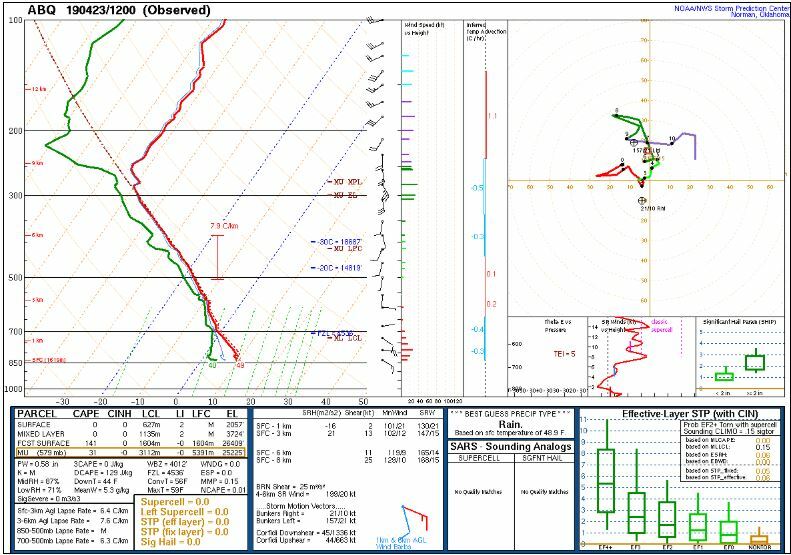 The 12Z upper air sounding from Albuquerque, NM, shows moderate humidity with no nearly-saturated layers. There was 0.31 inches of precipitable water in the column. 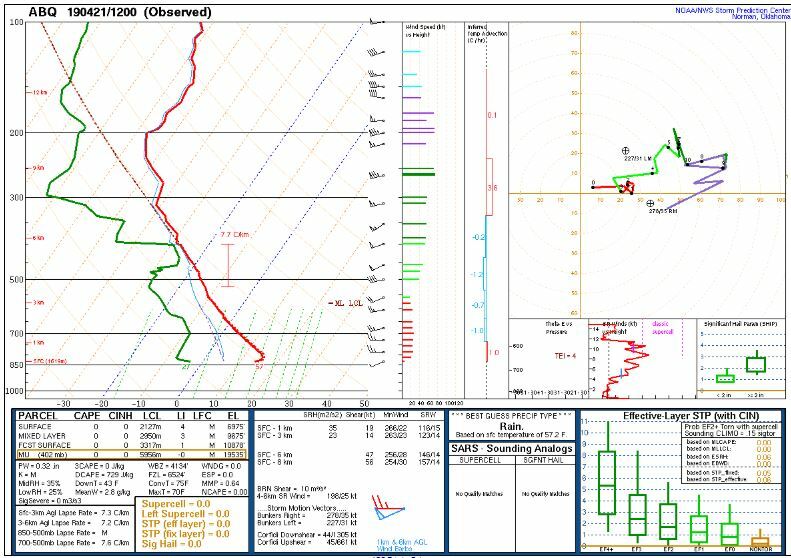 There was no Convective Available Potential Energy (CAPE) and no Convective Inhibition (CIN), and the Lifted Condensation Level (LCL) was 2007 m. There was a tiny thermal inversion near the surface and the 0-3 km lapse rate was 6.5 C/km. The hodograph shows that the low-level shear was 3 kts (due mostly to directional changes) and the deep-layer shear was 55 kts (due mostly to speed changes). 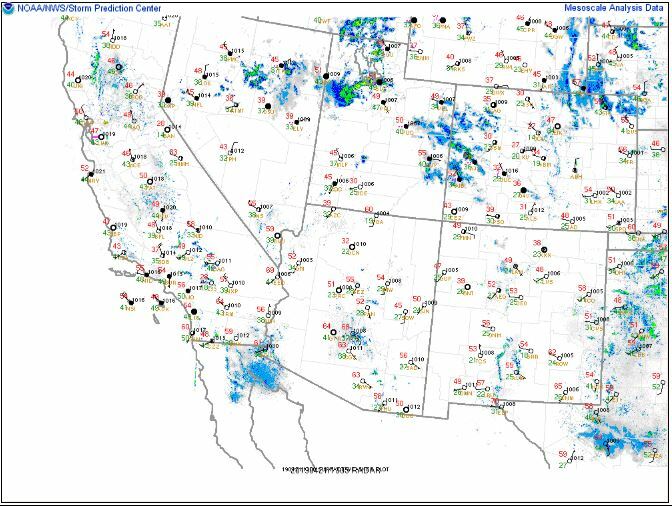 The surface observations chart (from the SPC Mesoscale Analysis Map) shows mild temperatures and low surface humidity this morning. The skies are sunny (according to the sensors) and the winds are light and variable. 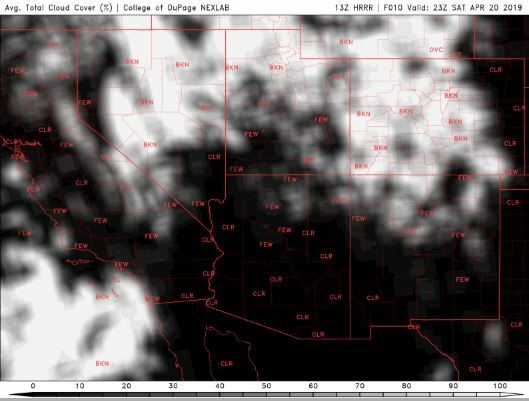 The HRRR predicts that the high temperatures for the middle Rio Grande River Valley will peak in the mid 70s F today. The HRRR shows that the dewpoints will remain in the upper 20s F and lower 30s F.
The HRRR predicts that the skies are expected to remain cloudy most of the day. Yesterday was a pleasant day. We sat outside and read and worked on little projects until the wind picked up in the afternoon. This morning has been mostly sunny, mild and still. 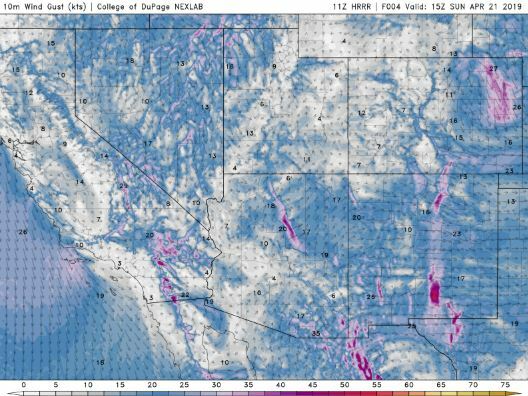 The NWS in Albuquerque, NM, forecasts (for Rio Rancho, NM) a mostly sunny day, with a high temperature of 78 F. The winds will be southwest at 5-10 mph, increasing to 10-15 mph in the afternoon. This evening will be mostly clear, with a low temperature of 47 F. The winds will be from the west at 10-15 mph, decreasing to 5-10 mph after midnight. 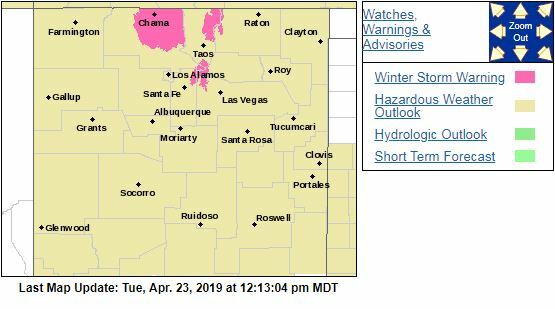 The NWS in Albuquerque, NM, forecasts (for Socorro, NM) a sunny day, with a high temperature of 83 F. The winds will be from the south at 10-20 mph. This evening will be clear, with a low temperature of 47 F. The winds will be from the southwest at 15-20 mph, becoming northwest to 5-10 mph after midnight. The NWS in Albuquerque, NM, forecasts (for Magdalena, NM) a sunny day, with a high temperature of 74 F. The winds will be from the southwest at 15-20 mph. This evening will be mostly clear, with a low temperature of 42 F. The winds will be from the southeast at 15-20 mph, decreasing to 10-15 mph after midnight. 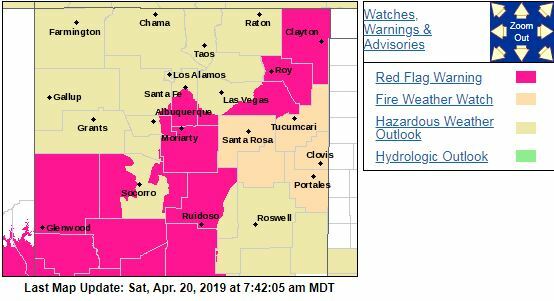 The NWS in Albuquerque, NM, has issued a Red Flag Warning for many of the counties in the northeastern corner of the state. 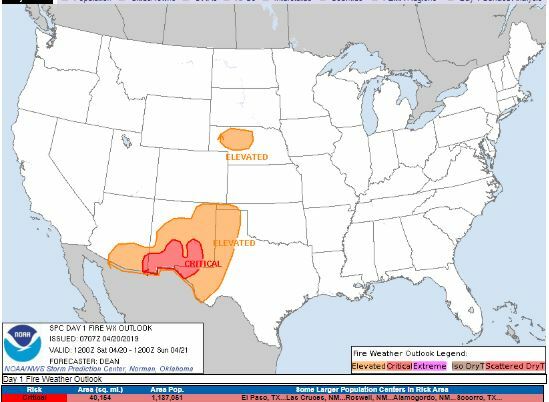 The Storm Prediction Center (SPC) has issued a Critical Fire Weather risk for two separate areas in the state today. The visible satellite imagery shows a few lingering clouds, particularly over the northwestern corner of the state. 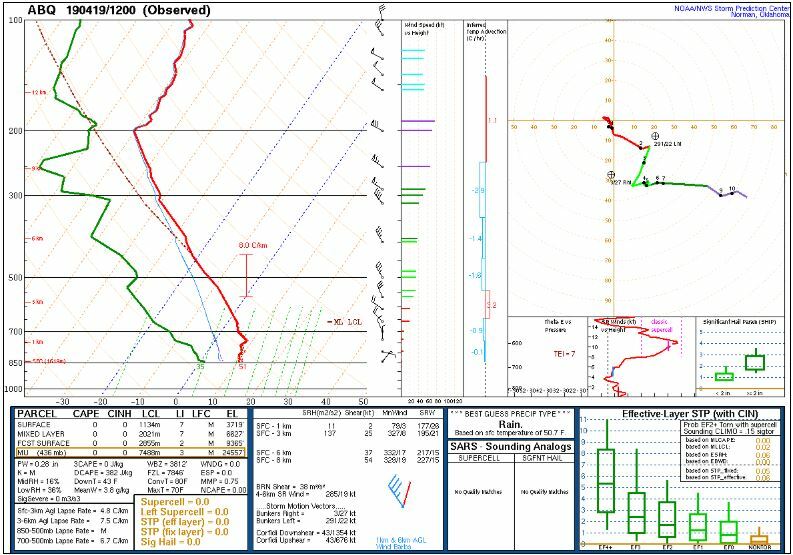 The 12Z upper air sounding from Albuquerque, NM, shows a nearly-saturated layer around 450 mb. There was 0.34 inches of precipitable water in the column. 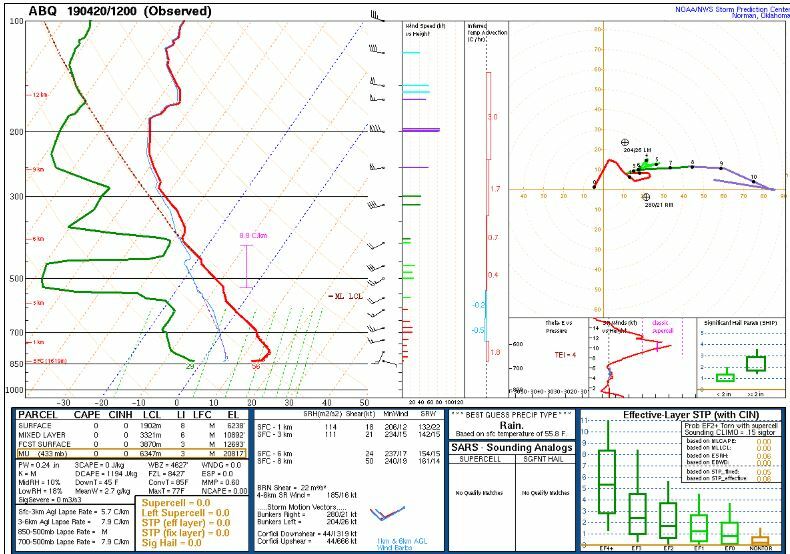 There was no Convective Available Potential Energy (CAPE) and no Convective Inhibition (CIN), and the Lifted Condensation Level (LCL) was 2127 m. There was a tiny thermal inversion near the surface and the 0-3 km lapse rate was 7.3 C/km. The hodograph shows that the low-level shear was 19 kts (due mostly to directional changes) and the deep-layer shear was 47 kts (due mostly to speed changes). 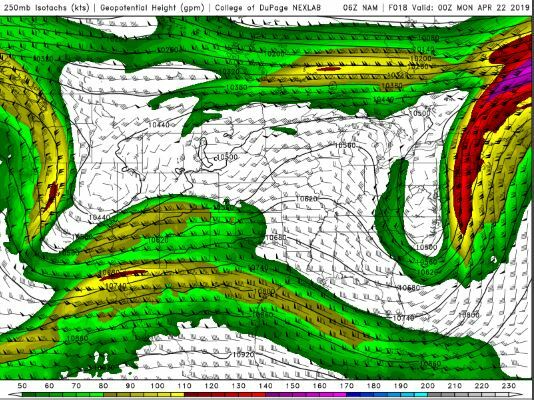 The NAM 250 mb chart shows moderate, zonal flow all day. 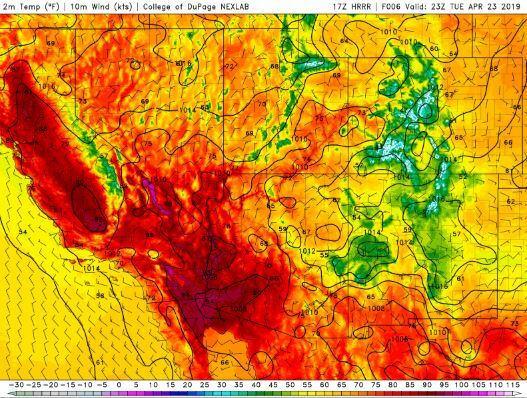 The HRRR predicts that the high temperatures for the middle Rio Grande River Valley will peak in the lower 80s F today. The HRRR shows that the dewpoints will slowly drop from the 30s F into the 10s F this afternoon. The HRRR shows strong wind gusts are possible today, particularly at high elevations. 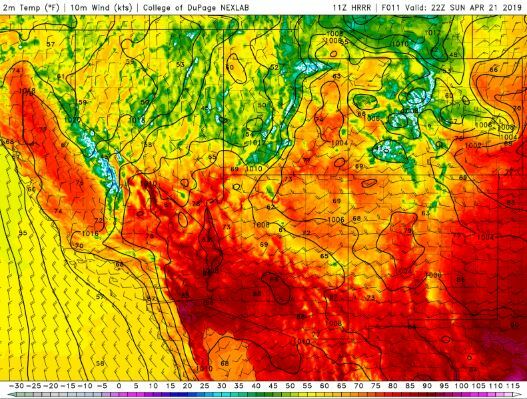 The HRRR predicts that the skies will remain mostly sunny all day. This chart has been excluded from today’s post. It’s going to be another beautiful day in New Mexico today. I’ll try to get outside and enjoy some of it again this afternoon. I’m going to go for a run and do a little work in the garden this morning. This week’s Satellite Image of the Week is of a developing cumulus field ahead of a cold front. 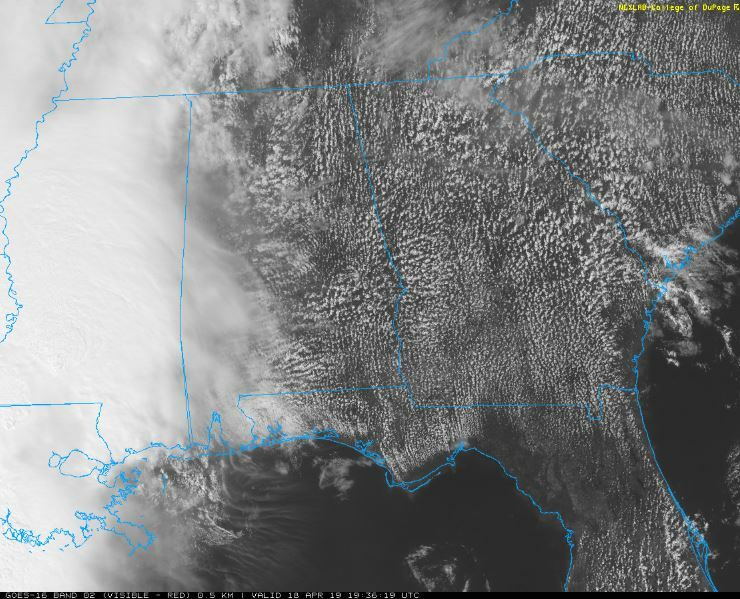 There is a clear line of thicker clouds near the MS/AL border, and a healthy cumulus field in the warm sector of this mid-latitude cyclone. There is a slight sea-breeze on the Florida coast, and there are cloud streets pointing to the moisture source (Gulf of Mexico, and others to the Atlantic) as well. This system continued northeast, bringing the severe weather to the Mid-Atlantic yesterday afternoon and evening. Yesterday was a pleasant day. I walked to the bus in the morning, then I walked from the bus stop to the repair shop in the evening. 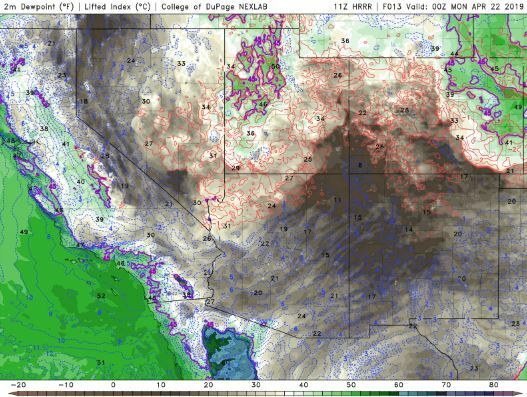 The NWS in Albuquerque, NM, forecasts (for Rio Rancho, NM) a mostly sunny day, with a high temperature of 82 F. The winds will be west at 5-15 mph. This evening will be partly cloudy, with a low temperature of 48 F. The winds will be from the southwest at 5-15 mph, becoming northwest after midnight. 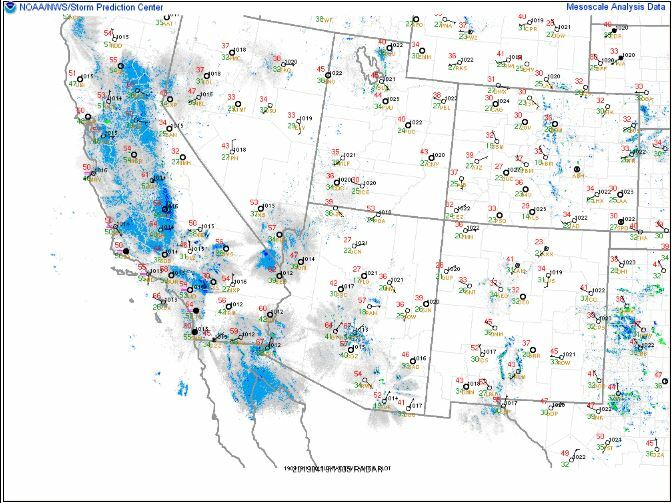 The NWS in Albuquerque, NM, forecasts (for Socorro, NM) a mostly sunny day, with a high temperature of 86 F. The winds will be from the southeast at 10-15 mph, increasing 20-25 mph, gusting to 35 mph in the afternoon. This evening will be mostly clear, with a low temperature of 49 F. The winds will be from the west at 15-25 mph, decreasing to 5-15 mph after midnight. 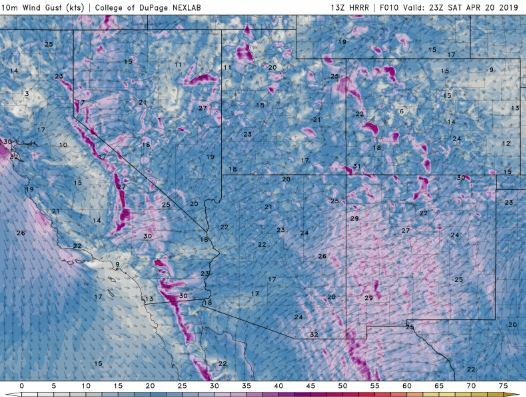 The NWS in Albuquerque, NM, forecasts (for Magdalena, NM) a mostly sunny day, with a high temperature of 78 F. The winds will be from the south at 15-20 mph, increasing to 20-25 mph and gusting to 35 mph in the afternoon. This evening will be mostly clear, with a low temperature of 44 F. The winds will be from the west at 20-25 mph, gusting to 35 mph, but then decreasing to 10-15 mph. 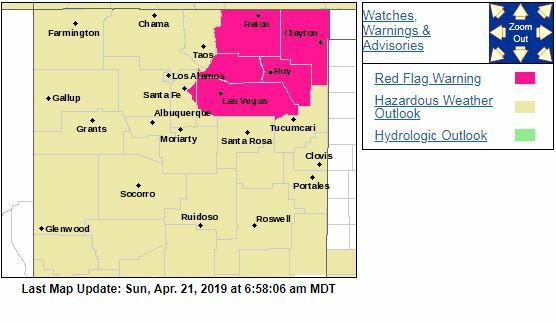 The NWS in Albuquerque, NM, has issued a Red Flag Warning for many of the counties in the southern parts of the state. 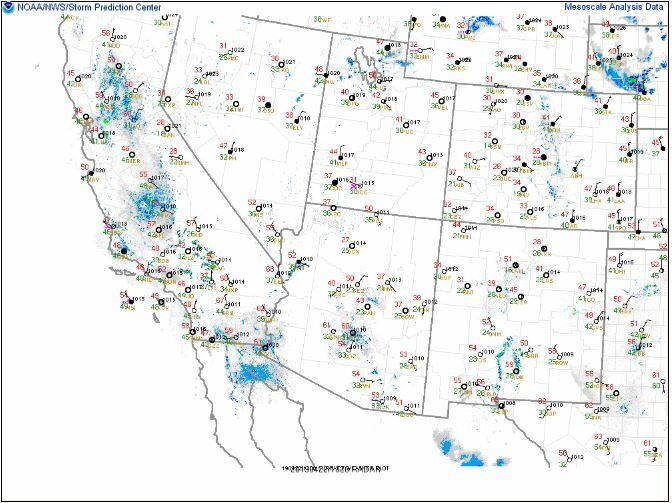 In fact, just about everywhere except the Rio Grande River Valley. 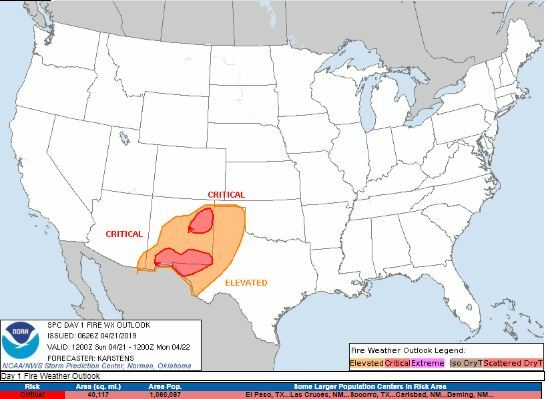 The Storm Prediction Center (SPC) has issued a Critical Fire Weather risk for the southern part of the state. 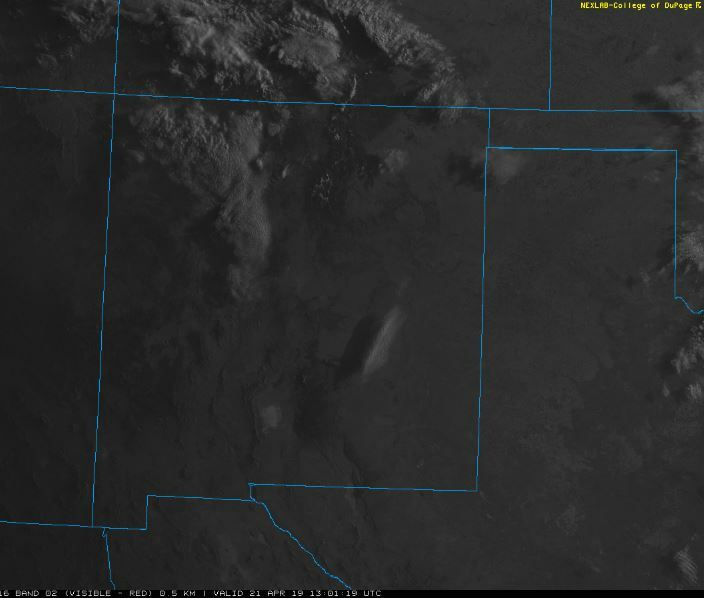 The visible satellite imagery shows very few clouds over the Albuquerque Metro area this morning. This image has been excluded from today’s post. The 12Z upper air sounding from Albuquerque, NM, shows a dry atmosphere. There was 0.24 inches of precipitable water in the column. 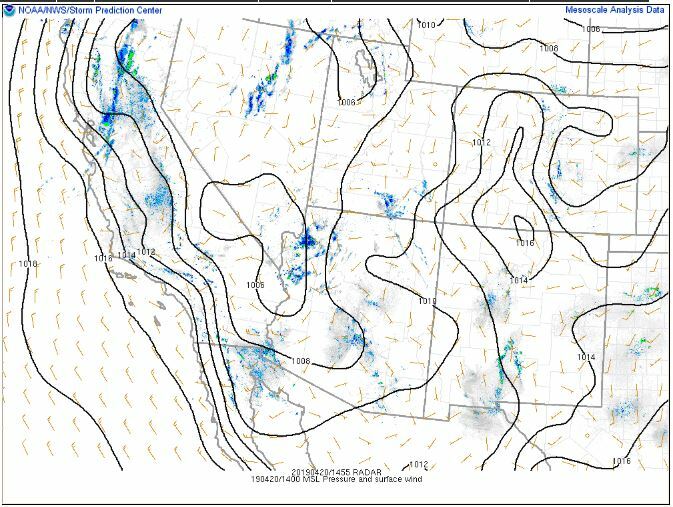 There was no Convective Available Potential Energy (CAPE) and no Convective Inhibition (CIN), and the Lifted Condensation Level (LCL) was 1902 m. There was a moderate thermal inversion near the surface and the 0-3 km lapse rate was 5.7 C/km. The hodograph shows that the low-level shear was 218 kts (due mostly to directional changes) and the deep-layer shear was 24 kts (due mostly to speed changes). The surface pressure chart (from the SPC Mesoscale Analysis Map) shows that we are under high pressure with no strong pressure gradients. 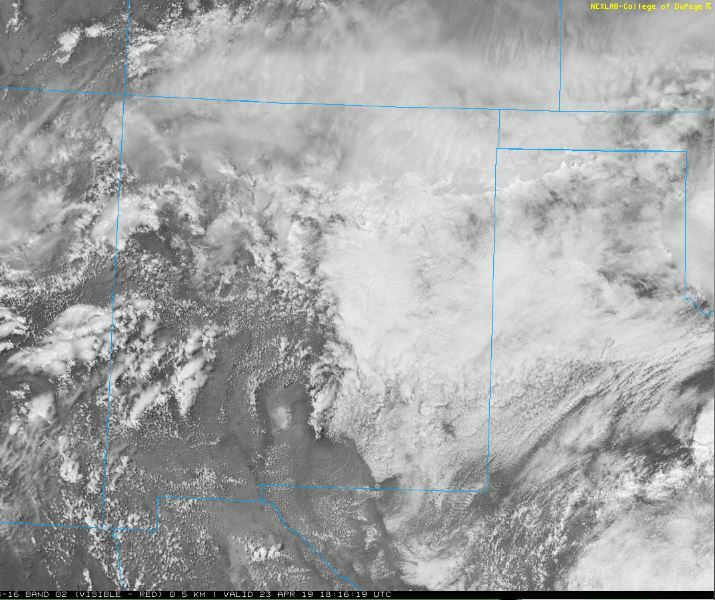 The RAP shows a low pressure developing on the lee side of the Rocky Mountains this afternoon. 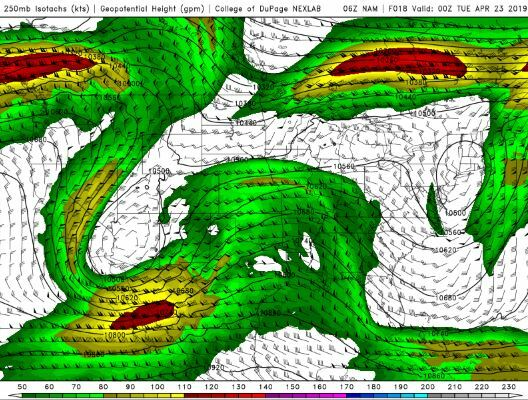 This will increase the pressure gradient over New Mexico. The NAM 250 mb chart shows moderate, northwesterly flow as we exit the back end of the trough. The HRRR shows that the dewpoints will slowly drop into the 10s F this afternoon. The HRRR shows strong wind gusts are possible today. 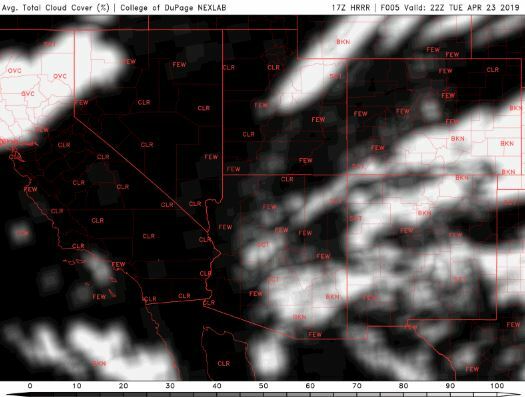 The HRRR predicts that a few clouds are possible, particularly in the northern half of the state. It’s going to be another beautiful day in New Mexico today. I’ll try to get outside and enjoy some of it again this afternoon. Yesterday was a pleasant day. Pleasant enough that some jackass tried to break into my truck and busted up the lock and the ignition cylinder. This morning has been sunny, cool and still. The NWS in Albuquerque, NM, forecasts (for Rio Rancho, NM) a sunny day, with a high temperature of 77 F. The winds will be light and variable, becoming southwest in the afternoon. This evening will be clear, with a low temperature of 46 F. The winds will be from the southwest at 5-10 mph, becoming southeast after midnight. 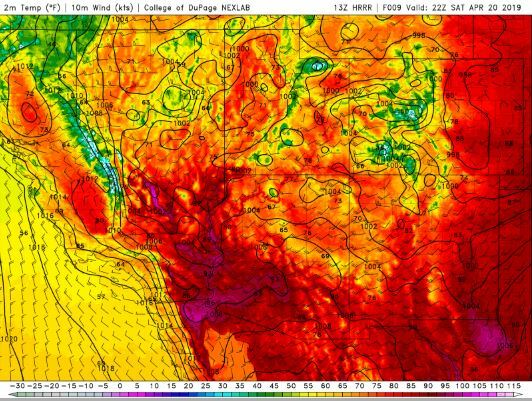 The NWS in Albuquerque, NM, forecasts (for Socorro, NM) a sunny day, with a high temperature of 80 F. The winds will be from the north at 5-10 mph, becoming southeast in the afternoon. This evening will be clear, with a low temperature of 49 F. The winds will be from the south at 5-10 mph. 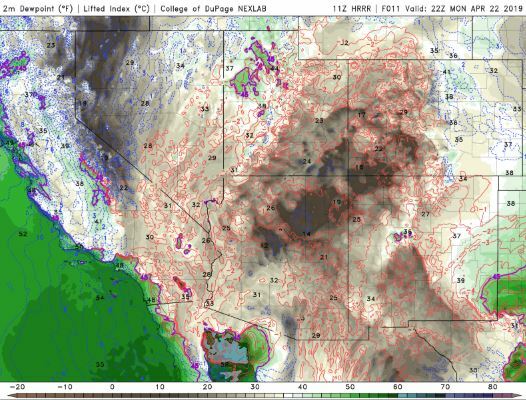 The NWS in Albuquerque, NM, forecasts (for Magdalena, NM) a sunny day, with a high temperature of 74 F. The winds will be from the northwest at 5-10 mph, becoming southeast in the afternoon. This evening will be clear, with a low temperature of 48 F. The winds will be from the southwest at 10-15 mph. The 12Z upper air sounding from Albuquerque, NM, shows a dry atmosphere. 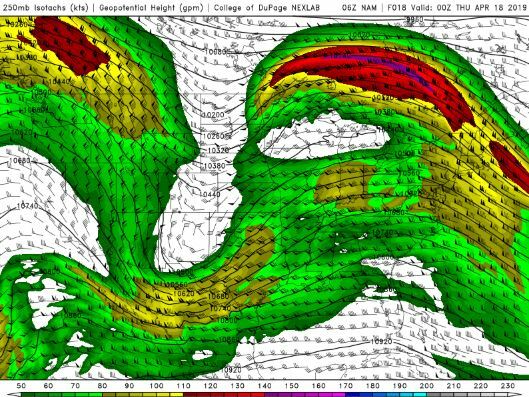 There was 0.26 inches of precipitable water in the column. 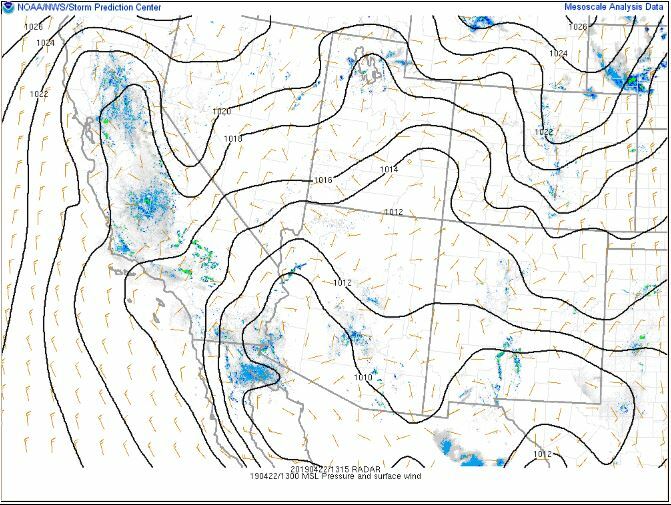 There was no Convective Available Potential Energy (CAPE) and no Convective Inhibition (CIN), and the Lifted Condensation Level (LCL) was 1134 m. There was no small thermal inversion near the surface and the 0-3 km lapse rate was 4.8 C/km. The hodograph shows that the low-level shear was 2 kts (due mostly to directional changes) and the deep-layer shear was 37 kts (due mostly to speed changes). The surface observations chart (from the SPC Mesoscale Analysis Map) shows cool temperatures and high surface humidity this morning. The skies are sunny (according to the sensors) and the winds are light and variable. The surface pressure chart (from the SPC Mesoscale Analysis Map) shows that we are under high pressure with no strong pressure gradients. The RAP says this is expected to continue for at least the next six hours. 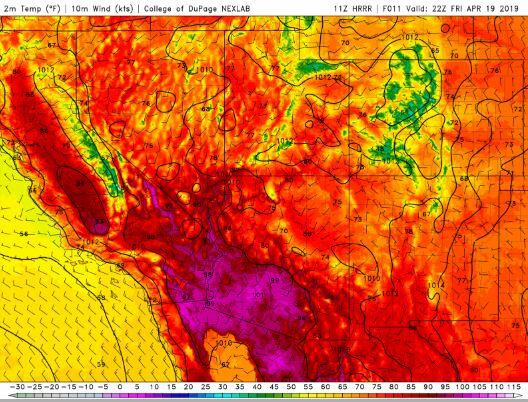 The HRRR predicts that the high temperatures for the middle Rio Grande River Valley will peak in the upper 70s F today. The HRRR shows that the dewpoints will slowly drop from the 30s F to the 20s F this afternoon. The HRRR predicts that the skies will remain clear, once the morning fog mixes out. This chart has been excluded from today’s post. It’s going to be another beautiful day in New Mexico today. I’ll try to get outside and enjoy some of it. Yesterday was rainy, cool and gross. I think we had a good, saturating rain that will help my garden. This morning has been foggy, but sunny, cool and still. 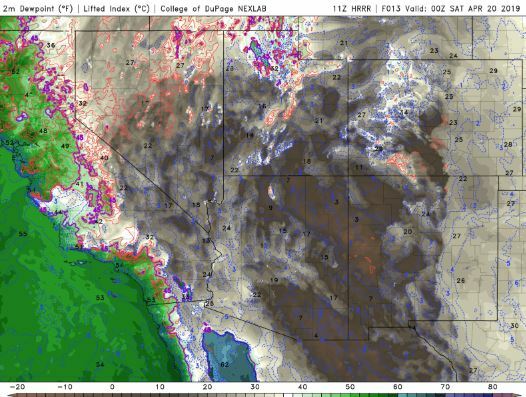 The NWS in Albuquerque, NM, forecasts (for Rio Rancho, NM) a sunny day, with a high temperature of 71 F. The winds will be from the north at 5-10 mph, becoming west in the afternoon. This evening will be mostly clear, with a low temperature of 42 F. The winds will be from the west at 5-15 mph, becoming north after midnight. 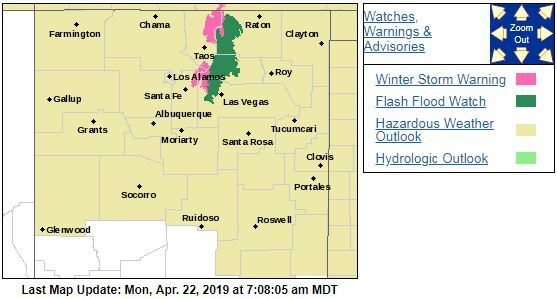 The NWS in Albuquerque, NM, forecasts (for Socorro, NM) a sunny day, with a high temperature of 75 F. The winds will be from the north at 5-10 mph. This evening will be clear, with a low temperature of 45 F. The winds will be from the northwest at 5 mph. The NWS in Albuquerque, NM, forecasts (for Magdalena, NM) a sunny day, with a high temperature of 68 F. The winds will be from the north at 5-10 mph. This evening will be clear, with a low temperature of 40 F. The winds will be from the west at 10-15 mph. 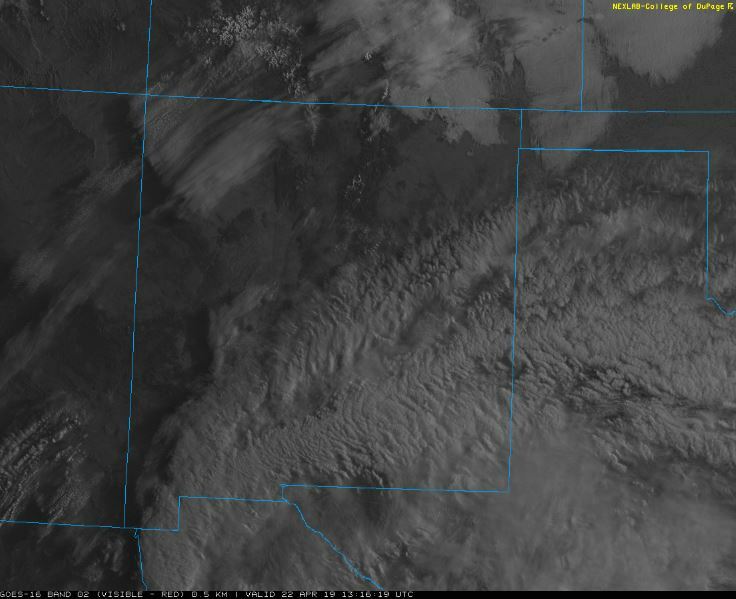 The visible satellite imagery shows fog over the Rio Grande River Valley and a few clouds over the eastern half of the state. The 12Z upper air sounding from Albuquerque, NM, shows a saturated surface, with dry air aloft. There was 0.34 inches of precipitable water in the column. 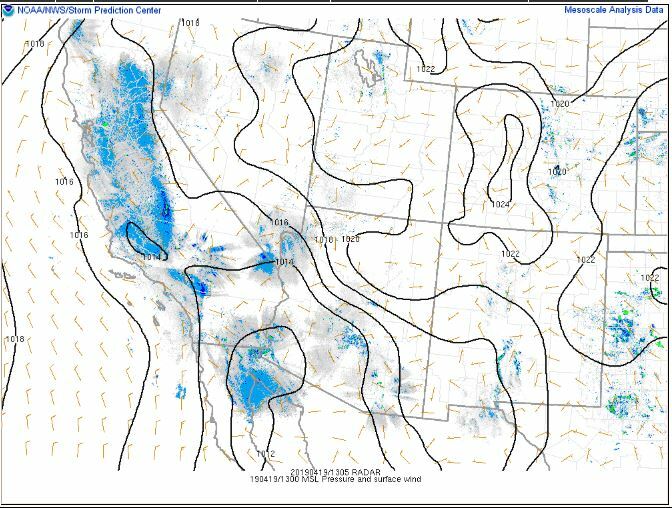 There was no Convective Available Potential Energy (CAPE) and no Convective Inhibition (CIN), and the Lifted Condensation Level (LCL) was 38 m. There was a series of small thermal inversions near the surface and the 0-3 km lapse rate was 4.5 C/km. The hodograph shows that the low-level shear was 18 kts (due mostly to directional changes) and the deep-layer shear was 40 kts (due mostly to speed changes). The surface observations chart (from the SPC Mesoscale Analysis Map) shows cool temperatures and high humidity this morning. The skies are cloudy in the northeast and sunny elsewhere (according to the sensors) and the winds are light and variable. 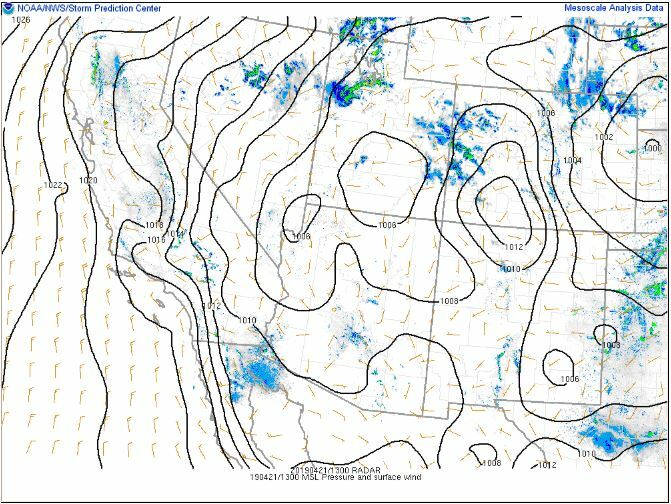 The surface pressure chart (from the SPC Mesoscale Analysis Map) shows that we are under no strong pressure systems or gradients so far this morning. 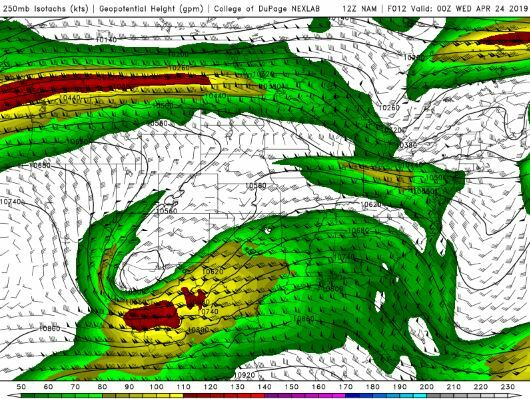 The RAP shows none are expected to develop in the next six hours. The NAM 250 mb chart shows moderate, northerly flow as we exit the back end of the trough. 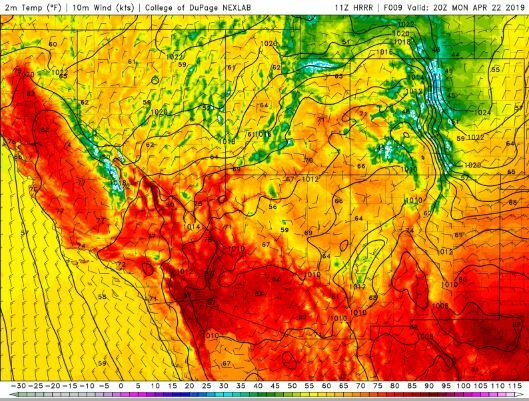 The HRRR predicts that the high temperatures for the middle Rio Grande River Valley will peak in the low 70s F today. The HRRR shows that the dewpoints will slowly drop from the 40s F to the 30s F this afternoon. Your regularly-scheduled beautiful weather will resume today. The ground will be a bit soggy, and I don’t expect it to dry out much, as the surface humidity will remain moderate throughout the day.